Thank you for joining us in praying the Novena to Our Lady of Lourdes! If you have had any prayers answered through Our Lady’s intercession during this novena, please share those with all of us below! May God bless you and be with you in your every need! We prayed to Mary to help us sell our home after three years of trying. Through our novena and prayers to Mary, she interceded and brought the buyer to us. Praise to Our Lady of Lourdes for answering our prayers! 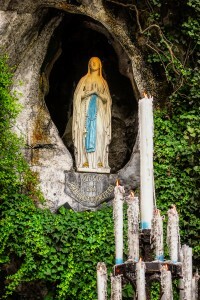 We thank-you most Holy Mother of Lourdes for answered prayers! During the Novena, we were told to pray for our finances and just this week, i was told that i should not be surprised to see an increment in my salary which has always been so small. I thank God and mother Mary for seeing me through. I’m sorry to have taken so long to give my testimony for the novena I prayed for feast of Our Lady of Lourdes. I had a sharp pain in my right hand and I was so worried that I was not able to pick up and anything heavy especially my 2 year old grandson Anthony whom I babysit. Today thanks to Our Blessed Mother Mary in conclusion of the novena I can attribute my cure to her healing touch. Thank you Jesus for your loving Mother who takes all our ills and places it in your hands. And God Bless you my friends John-Paul and Annie. I asked Mary to intercede for my dear friend who was facing almost certain amputation of her foot (and possibly her leg,) as a result of an unhealed wound of two years from foot surgery. She just called me this week saying that the doctor from the wound clinic is now calling her their “miracle wound” patient! We are so very grateful to Mary and Jesus! God is so great!! A miracle at Easter! Alleluia!